Mechanical watches are beautiful marvels of engineering packed with minute gears, bearings, and intricate parts all put together into what amounts to a blend between art and science. While such watches are certainly a tiny marvel you can wear on your wrist, there are two things that have, both historically and even in the present, been strikes against them–a good mechanical watch is very expensive and it isn’t necessarily the most accurate. It’s not uncommon, even with luxury brands, to find yourself resetting the time every few days and making other small adjustments to your mechanical watch. The two negative aspects of mechanical watches–expense and inaccuracy–were completely fixed by the introduction of inexpensive and highly accurate watches in the 1970s that were built around a different kind of time keeping. Rather than keep time via the intricate movements of tiny gears buried inside a watch case, these new “quartz” watches relied on a tiny wafer of quartz crystal to keep time. In place of tiny rotating gears, the time was kept by measuring the pulses of electricity passing through the quartz wafer and the resulting oscillation of the crystal. Unlike expensive mechanical watches, wherein over the course of a year the watch might lose hours (or more) of time if not carefully tended to, these cheaper watches based on crystal oscillators could keep time with zero intervention from their owners and might only lose a minute or two of time over the course of an entire year. 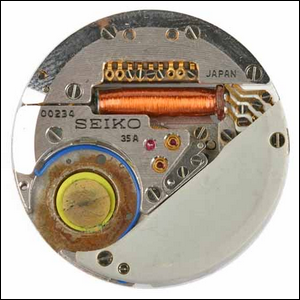 The very first quartz movement watch, the Seiko Astron–seen with an open back in the photo here–was historically significant for two reasons. Not only was it the first in its class, but it also touched off what is now called the “Quartz Crisis”–the period of enormous economic upheaval within the watch industry created by the introduction of cheap quartz watches. Interestingly enough, although quartz watches rapidly overtook mechanical watches in the late 20th century, the rise of cellphone use triggered a decline in general watch purchases (as people now used their cellphones as time pieces). As such, mechanical watches now enjoy a share of the watch market they haven’t had since the 1960s due to one simple factor: people are wearing watches as a style choice and not a necessity, allowing the mechanical watch to easily reclaim its place as an intricate personal accessory. Image courtesy of Deutsches Uhrenmuseum.